Play At Height Adventure Centre in Dingle Kerry offers you a day full of fun and activity. They have a multitude of activities to get your adrenaline pumping including abseiling and wall climbing. Play At Height is great for party venues with its Gecko Kids Club and even welcomes school tours. The many adventure activities at Play At Height include the indoor climbing wall, which is one of the biggest in Ireland, a 150ft high zip wire to make you feel as though you are flying, an abseiling wall and a Powerfan which is similar to bungee jumping or parachute jumping but without the need for straps or parachutes as you safely land in a controlled environment. At Play At Height we have climbing to suit everyones climbing abilities. Beginners : Start on the nice easy slab climbs, lots of big hand holds and a sloping wall makes for a great climbing area to start on. Your safety will be assured using either the autobelays devices or with the Play At Height instructors holding your ropes for you. Intermediates : Play At Height have a huge range of climbing skills and techniques to help you improve your climbing. Learn to lead on the easier slabs or push your grades on the feature wall , its up to you. They also have a dedicated bouldering wall where you can work on a wide range of well set problems. Advanced : All of the climbing routes at the wall are bolted for leading. 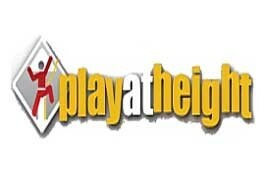 Play At Height main lead wall has an 8.5 metre overhang and is 12.5 metres high! They have graded climbs up to 8a , but the main feature wall at Play At Height has multiple possibilities to create your own routes and push your limits. Play At Height also hosts national competitions annually. Younger kids can enjoy Play At Height Adventure Centre with Gecko Kids Club. It features a playground, indoor play area, activity tower, soft toys and activity pods. Gecko Kids Club is ideal as a party venue for kids birthday parties at Play At Height Adventure Centre. When you enjoy your school tour at Play At Height a team of expert instructors guide you and your friends on one of the country’s largest climbing walls. The High Rope trail will really get the excitement going with a series of aerial challenges at 12 meters high. To end the day on a high you can attempt the freefall which boasts a 40ft high jump. The cost of school tours at Play At Height is €8 per child for 90 minutes climbing and high rope activity or else €20 per child for 3 and a half hours play.